This design analysis is based on Mangagamer’s version of Higurashi When they Cry. There will be (major) spoilers below, in particular from the 3rd arc. This Design Analysis will start with an introduction which will be followed by a review and end with the actual analysis. 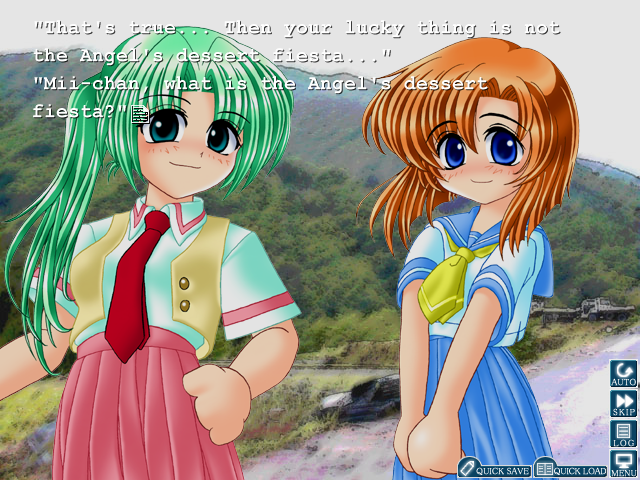 The focus of the analysis will be on how Higurashi plays with the reader's mind. 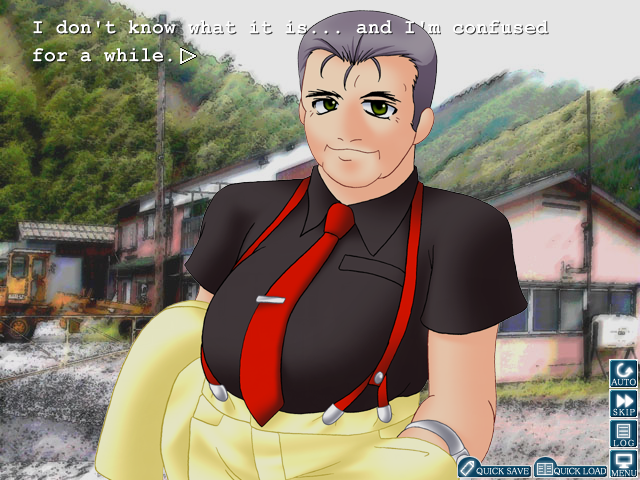 Higurashi is a mystery horror visual novel about a small town called Hinamizawa and the curse of Oyashiro-sama. Oyashiro-sama, the protective deity of Hinamizawa curses 2 people every year on the day of the Watanagashi festival. One dies and one gets “demoned away”. You follow Keiichi Maebara a boy that recently started living in Hinamizawa. In every arc Keiichi somehow gets involved with the curse and has to try to figure out what going on before it’s too late. Is the curse real or just some kind of conspiracy? The novel presents it in such a way that you can never rule out one of the two. 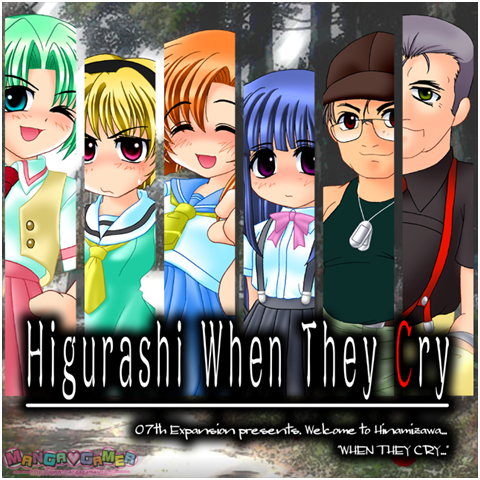 Higurashi is divided in 8 arcs. The first four arcs are called question arcs and like the name says, they throw up more questions than they answer. The last four arcs, which I won’t analyze here, are called the answer arcs and they are the exact opposite of the question arcs. Every arc of the question arcs except the fourth tells a story involving Keiichi and the curse. The first three start more or less with the same status quo, but go in their own direction. When someone dies in one arc he will return in the next. All of the stories show a different side of the mystery, by combining every arc you can figure out the secret behind Oyashiro-sama’s curse. The first arc introduces the basic outline of the villages, the main characters and the mystery. In this arc the village is still relatively new to Keiichi. This gives a good excuse to explain to the reader the workings of the village and Keiichi’s relationship with the inhabitants of the village. In this story Keiichi tries to find out what his friends have to do with the recent murder and in the process discovers he could be a potential target for Oyashiro-sama’s curse. The second arc has two major plot points. The first being if Keiichi’s friend, Mion has a second personality or if she really has twin sister. The second plot point isn’t really a plot point but rather a catalyst. Keiichi and a few other people enter the sacred storage which is forbidden. Afterwards the people that entered the sacred storage and the people they care about start dying. This arc’s mechanic is about how it presents its information to the reader. Every time you think you understand the situation the next piece of information will shred the trust you had in your knowledge a bit more. It forces you to reevaluate everything you thought you knew. It does this multiple times, keeping you off balance all the time. Because the reader doesn’t know what to trust as a fact anymore paranoia kicks in. The 3e arc focuses on Keiichi’s friend Satoko. A little girl that always sets traps to gain attention and doesn’t like to lose. The story does a great job at making you care for her. Which makes it only worse when her “happy days” have to come to an end. That happens when Satoko’s uncle returns to Hinamizawa. Satoko’s parents died a few years back and she and her brother had to start living with their uncle and aunt. Their Aunt and Uncle begun abusing them mentally and physically by letting them do almost impossible chores and hitting them. This all stopped when their aunt was killed, her brother disappeared and her uncle fled the village. When her uncle returns this all starts again. Because he is her legal guardian she has to start living with him. Keiichi and his friends frantically try to find a way to get her away from her uncle, but it’s legally impossible. The game does a good job of making you feel hopeless to save her. It does this by grounding everything in cold hard reality, which destroys every plan you can come up with. So there is only one option left to save her. Satako herself endures the abuse. She thinks that her brother ran away from home, because she was too much of a burden. When she was being abused her brother always had to protect her. As a way to prove she has matured and won’t be a burden to him anymore when he returns, she endures it all. The fourth arc is different from the first three in that it uses another perspective than that of Keiichi and takes place in the past. You follow a police investigator called Mamoru Akasaka who is sent to Hinamizawa to investigate the resistance movement, the Onigafuchi Guardians. The minister of construction's grandson has been kidnapped by an unknown party and The Onigafuchi Guardians are one of the potential perpetrators. This arc gives a look at one of the most important events in the history of Hinamizawa: The village existence was in danger because of the construction of a dam. This dam would cause the village to be flooded. The villagers were of course against this and created the resistance movement, The Onigafuchi Guardians. The Onigafuchi Guardians did everything they could to stop it: petitions, demonstrations, letting an expert of wildlife defend Hinamizawa and even illegal things like sabotaging de construction vehicles. The tension in the village had increased to levels that the village itself had become a hostile environment for supporters of the dam project. 1. You play to win! You must never play lame! Because of these rules the games get an extra layer. When a game begins adrenaline fueled music starts to play and everyone starts to search for any clue they can use to win. Losing isn’t something you would like to do, because the loser(s) will get punished. They have to for example to wear a girls swimsuit and touch the principal who does karate’s bald head. Hilarity ensured. After every chapter you get ‘Tips’. ‘Tips’ are bite size bits that give you background information about the events in the story. It can be something like notes out of a scrapbook, a police report or a quick look through the eyes of another character. They create the distance you need to look at an event objectively. The story is being told from an ‘I’ perspective, which put you up close to the action. This can make you lose the big picture and get you swept away by emotions. Tips also prevents the reader from getting a biased perspective because normally you're only getting Keiichi’s or Mamoru's view on things. After completing an arc you unlock an After-Party. An After-Pary is a small segment where the main characters come together as actors to talk about the arc they just wrapped up. They discuss some mayor plot points and throw up pros and cons for the curse and the conspiracy theory. They never say which one the correct one is, but give the reader some new stuff to think about. This is all done in a playful manner. The art isn’t very good compared to other visual novels, but it has a unique charm, with its puffy 4 fingered spites. It does takes some getting used to. Higurashi uses a lot of different background images for its locations. Because Higurashi was produced by just by 2 people, they didn’t had the luxury to draw all their background images from scratch. 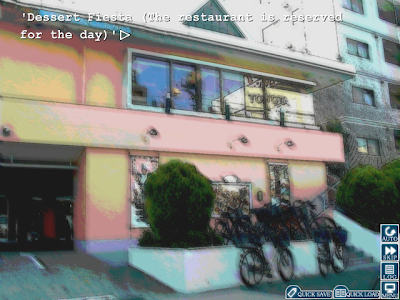 So instead they used a technique often seen in visual novels created by small teams: They take photographs of locations and overlay them with filters until they have their desired result. The advantage of this method is that they can create many background images relatively easy. The amount of background images found in Higurashi does give the reader a good impression of the size of Hinamizawa. The music is very good and set the tone of the scenes very well. In Mangagamer’s version not all of the original Japanese version’s songs are included. They couldn’t use some of the songs because of some license issues, so they replaced them with their own songs. This isn’t a bad thing, because the replacement music is just as good or even better than the original music. Higurashi doesn’t use many sound effects. Most of the sound effects that are used, are used in the club activities and when someone gets mutilated (the fun stuff ;) ). There is one sound that always returns and is with you most of the time. Which is the sound of the Higurashis. Higurashis are a type of Cicada that live in Japan. The sound the Higurashis make is one of Hinamizawa’s characteristic attributes. The Higurashis are always with you when something good happens and something bad, they are the spectators of Hinamizawa. The characters in Higurashi aren’t based on the usual stereotypes, they’re interesting and unique. Of those characters most of the conversations will be with Keiichi’s friends, which are Rena, Mion, Satoko and Rika. Keiichi’s friends all have their own distinct personalities and are somehow connected to the curse. The story fleshes them out and makes you care for them. Rena Ryugu is a bit of a strange girl she is a bit naive and ditzy, but she picks up more than you think. She also has an obsession with cute things. When she is in her “adorable mode” you wouldn’t want to be between her target and her. Mion Sonozaki is the leader type and fun maker. She sometimes talks like an old man. She’s also the successor of the Sonozaki family. Which is the family who currently controls Hinamizawa. Satoko Houjou is always laying out traps, but those are actually just to get attention. Rika Furude is the adorable little girl. She is smarter than she looks and uses her cuteness in her favor. She is also the head priestess of the Furude shrine. The shrine is dictated to the worship of Oyashiro-sama. Some of the arc related mechanics I already highlighted earlier, but those aren’t the only ones Higurashi uses. You may have noticed that I’m referring to the reader as the one experiencing everything in the story rather than the main character (Keiichi or Mamoru). That’s because you follow the story through their eyes. When you’re reading, your and the main characters' perspective start to overlap. There will be times when you’re thinking 'did “I” or didn’t “I” do that' when you’re looking back at past events the main characters did in the story. That’s because the main characters are referring to themselves as “I” just like you. This first person perspective makes it much easier for emotions (of the main character) to be sent to the reader than if the story was told from a third person perspective. When the main character is distressed the reader also feels distressed. Thus psychological tricks like the ones used in Higurashi are very effective with this perspective. The psychological trick used in the story won’t affect the reader outside of the story, because reality and the visual novel are too different from each other. The I perspective is a common element in most visual novels, but I highlighted it here because of its exceptional use. The first half of every arc shows the current everyday life of Keiichi and his friends. It’s used to lay out the groundwork for the second part where everything will hit the fan. In the first part the reader gets accustomed with the laws of reality used in the story. These are the laws that say what’s possible in the story like for example ’if pigs can fly’. The reader will use them to predict what’s going to happen next. The laws Higurashi uses are very much the same as in real life. In the second half of an arc things start to happen which don’t mesh with the earlier stated reality laws. When this happens the reader gets confused and starts to search for a way to explain these strange phenomena, but no matter how hard he tries he won’t be able to. Not knowing how these contradictions are possible, they become horror elements. By piling up all those contradictions and increasing the pressure on the reader, he starts to feel anxious and uncomfortable and this is only the beginning. Mystery stories reveal almost always everything at the end. So rather than claiming the story is broken the reader just endures it and will constantly try to find a way to explain the contradictions, but only to see it gets worse. There are many different perspectives used in Higurashi. Some of those perspectives are the main character, The Tips, The After-Parties and the end report after every arc. The most notable ways they’re used is to show the scale of the setting and mystery and to give the player more insight in the mystery. These insights have a positive and a negative side. Because of the amount of information you are given you can overlook important details, but it will also help the reader develop his theory about the curse. The highest level the story can get with its psychological manipulation is inducing a sense of paranoia in the reader. It happens when the main character isn’t totally certain about something, but if he’s wrong it will have big consequences for him. To bring the main character to this state he first has to be weakened mentally. Every arc (except the fourth) does this in a different way. In the first arc Keiichi gets more and more isolated from the rest of the village. He can’t trust his friends anymore, because they’re all somehow connected to a murder case (that happened in the past), they’re keeping things from him, they suddenly act differently and start to threaten him. When he even discovers he could be the next target of the curse he totally loses it and starts carrying a baseball bat with him. Because of this isolation Keiichi is much more susceptible to paranoia than normal. In the second arc this is done by repeatedly betraying the reader’s expectations of how things fit together. In the third arc this is done by the shock of the realization that Satoko’s uncle is still alive, when you're sure you've killed him. Something doesn’t add up. You have to make sure what happened that day, because if you didn’t kill him, what did really happen that night, who did you really kill? The story often gives the main character a theory or makes him assume things which aren’t yet proven. You as the reader also assumes the theory or assumption is right, because there isn't any indication it wouldn't be and the story points in that direction. The reader starts to build his own theory around the theories or assumptions given to him. Then suddenly he discovers the base theory is wrong, leaving him feeling abandoned and lost. He has to start from scratch again to create a new theory. This state of mind will often be followed up by another mind trick. A radical change of tone often happens when something unexpected happens. A character suddenly acts creepy or the reader comes to a revelation. Mindfucks happen when something extremely unexpected happens. Most of the times it is accompanied with a change of atmosphere in the scene. They are one of Higurashi’s trademarks. You totally don’t see those moments coming, which is what makes them so powerful. A few example are, when Keiichi gets “possessed” and realizes he can only save Satoko if he kills her uncle or when Keiichi almost swallows a needle that was hidden in a ohagi(a type of rice balls) which was given to him. Remaining Notes Not Used in the Analysis Because of its Already Huge Length. 1. You get information about one side of someone and later on you get information about that person's other side. This makes you doubt if the things you know about this person are really true . The source where you got your information from is a very important indicator to check how reliable the information is. The reader probably thinks that the last information he has gotten is the most reliable, because you're used to that a story reveals its secrets later on or at the end. 2. Suspicious coincidences are made scary by making the wrong conclusion based on them and in that way they´re spread as rumors. [He’s called] "Oyashiro-sama's servant" "...Because people say that the guy chooses the next victim"
3. New information can put a new light on things you didn’t see earlier. [About Oyashiro-sama's victims]"It is remarkable that half of them have the Houjou family name." 4. Too much information and perspectives makes you lose the big picture. The writer can use this to hide important information which should come up later in the story. 5. You can hide the truth under lies and rumors. That way the reader won’t find out what is a lie and what's true until the writer reveals it. 6. Not knowing something with certainty leads to worrying and with enough pressure can result in paranoia. 8. The story makes sure the reader doesn’t focus on certain plot points. It does this by keeping the reader’s attention away from those plot point and by making them seem not important. (Who is the psycho that killed Satoko’s aunt). 9. There are moments where suddenly it seems like something isn’t possible within the story laws. Like everyone saying that Keiichi went to the festival while he didn’t or when Keiichi gets stabbed by Mion will she is supposed to be dead at that moment. 11. A contradiction leads to not knowing what to trust as real anymore which can with enough pressure on the character result in a sense of paranoia. 12. Giving sense of safety by sharing his secret with someone he can “trust” and suddenly taking that sense of security away from him makes the reader feel betrayed and unsafe again. The next time he won’t trust another person that easily again. 13. Contradictions that aren’t supposed to be possible with earlier events and information given to the reader. 14. Information is given to the reader only bit by bit throughout the story. 15. In the beginning of the first three arcs the pacing is very slow. This slow pace helps lay out the ground work for the second half of the story. 16. The poem in the beginning of every arc is there to get the reader interested in the arc and hints at what’s to come. 17. Every arc starts with a happy everyday life, then a twist comes and it turns scary with the added horror elements. Because of the contrast between the two the second parts becomes more powerful. 18. You can most easily control the focus of the reader when he hasn’t discovered the structure of the story yet, because of that he won’t be able to guess where the story is going. So you have to constantly throw curve balls at him, switch things around and confront him with new things to make sure he doesn’t notice. 21. The switch from the normal spirits to a possessed one is pretty effective . They only have to change the eye color and facial expression of a normal spirit. 22. 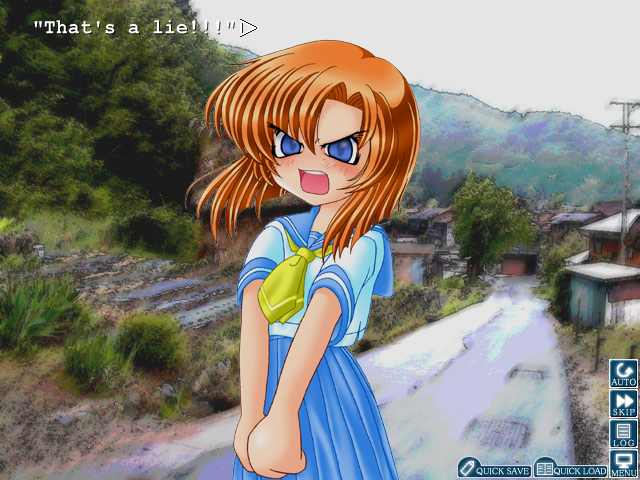 The style of narrative Higurashi uses is a very realistic and story focused style. You can also see this from the fade outs used which are unnoticeable. 23. Higurashi uses its fade outs to indicate that the main character is turning in a direction. The direction the player turns isn’t very noticeable, because the reader is focusing at the center of the screen not the edges and because the fade-outs themselves are too subtle. 24. Fade to black is used to indicate time has passed or the main character has moved to a different location. 27. Every arc has a different mechanic. 28. No choices and branching paths like a visual novel usually has. 30. Every arc has its own charm. Where can you get this visual novel? and you can buy the rest of Higurasgi When They Cry here.